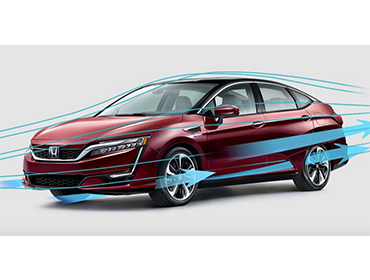 * Clarity Fuel Cell is currently only available through authorized Honda Clarity Fuel Cell dealers in California to residents of California living or working in proximity to a hydrogen fueling station. Unlike other cars in it's class, this Clarity uses a fuel cell stack that fits entirely under the hood, resulting in a spacious 5-person interior. With on-screen prompts and a familiar pump design, fueling your Clarity Fuel Cell is as quick and simple as filling up a gas-powered car. The naturally-inspired body shape streamlines airlfow over the top, sides and under the vehicle contributing to quite comfort as you drive. The Clarity Fuel Cell is designed around the driver, from the one-touch electronic gear selector to the performance boosting Sport Mode. 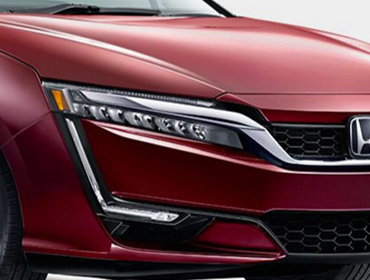 The ultra-thin, ultra-bright inline LED Headlights with Auto-On/Off are designed to make the Clarity Fuel Cell recongnizable as the environmental flagship vehicle for Honda. 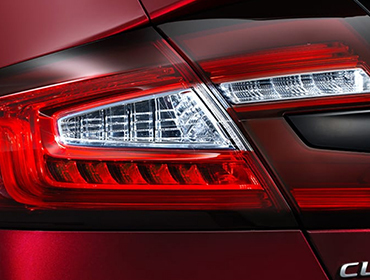 The rear taillights have been outfitted with high intensity red LED lights for an unforgettable visual signature. Honda designers drew inspiration from nature: a bird with its wings drawn in. This streamlined shape manages airflow for a uniquely efficient aerodynamic profile. The sound-insulated cabin of the Clarity Fuel Cell is a unique balance of comfortable convenience and premium technology, all within your reach. The touch-sensitive steering wheel-mounted controls make it easy to answer calls, adjust the volume and access driver information. Innovative features like the Plasmacluster® Ion Technology help to break down germs, destroy odors and improve air quality at a molecular level. With a trunk this spacious, there's plenty of room for several large pieces of luggage for a weekend getaway. Adjustable cupholders make it easy to securely fit a variety of drink containers. With thoughtful craftsmanship and high-quality leather, the premium rear seating comfortably accommodates up to three adults. Constructed of resilient and lightweight carbon fiber, the hydrogen fuel tanks are mounted securely within the frame to protect them from impact. With integrated washer nozzles, the rain sensing Smart Wiper System conserves washer fluid while maximizing visibility for a clear view.